Aleksey Kivshenko. 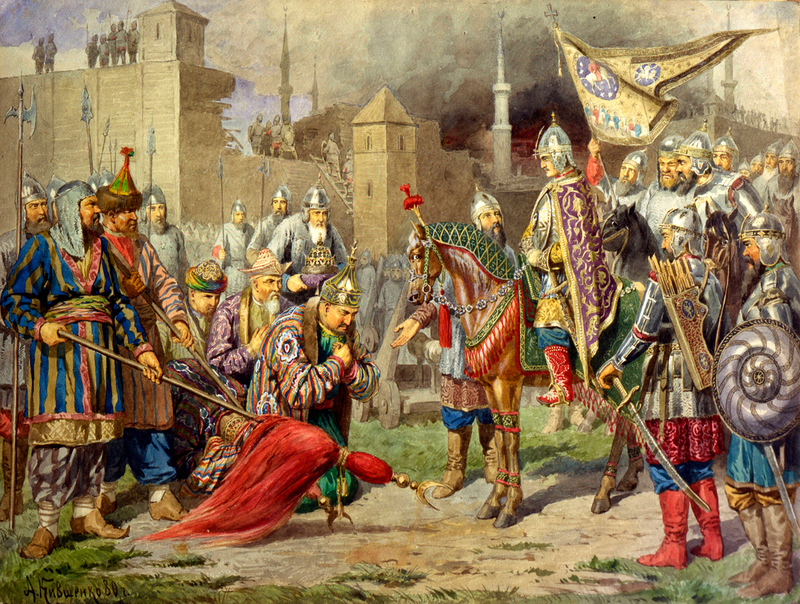 'Tsar Ivan IV Conquering Kazan in 1552', 1880. The city of Oryol (220 miles south of Moscow) erected the country’s first monument to Ivan IV, also known as Ivan the Terrible, in October. He was one of many Russian rulers who remain divisive figures even today. We look at how he made it into the history books. Upon reaching adulthood in 1547, Ivan was crowned Tsar of All Russia. All rulers of Muscovy before him were Grand Princes. Ivan was the first to appoint himself ‘Tsar’ or "Caesar," in the European tradition of "emperor," whose power came directly from God. The title gave Russia and its ruler significant weight in the eyes of contemporary European monarchs. Ivan the Terrible was recognized emperor by Queen Elizabeth I, by the Holy Roman Emperor Maximilian II from the House of Habsburg and others. Ivan maintained a long correspondence with Elizabeth I and, according to legend, even asked for her hand. She declined the proposal but it was then that Russia and England first began trading with each other. As a youth Ivan IV tried to govern in a progressive manner. In 1549-1560 he administered the country along with an informal government called the Elected Rada (a circle of confidants, young representatives of the aristocracy and the clergy). The Rada implemented a series of important reforms, concentrated power in the hands of the tsar and limited the boyars' authority. Ivan later dissolved the assembly and began governing on his own. After the Elected Rada, came the oprichnina, an era of cruel repressions in 1565. The tsar divided Russia into the Zemschina (or districts) where the boyars maintained their authority, and the Oprichnina, which Ivan ruled directly with the help of his oprichniki (bodyguards who made up the National Guard). The nucleus of the ‘Oprichnina’, according to contemporary German aristocrats Taube and Krause, consisted of a certain "church order," headed personally by Tsar Ivan. The members of the order dressed like monks and prayed together with the tsar. Their symbols were a dog's head and a broom. "This means that first they bite like dogs and then sweep everything redundant out of the country," wrote Taube and Krause. Until 1572, the oprichniki terrorized the boyars and their supporters, eliminating entire families. "Even women and children were killed, women who were accused of infidelity were mockingly abused and people were tortured publicly in the cruellest of ways," wrote historian Dmitry Volodikhin. At the end of this period even the leading oprichniki were killed. Historians estimate that at least 4,500 people died in these purges – a large number for that era. Ivan spent most of his reign at war, trying to expand the country's territory. He defeated the Khanates of Kazan and Astrakhan, uniting them with Russia. He also appropriated the Volga and Urals and began exploring the vast lands of Siberia. On the other hand, however, Russia lost the Livonian War (1558-1583) against Sweden and the Polish-Lithuanian Commonwealth and could not gain access to the Baltic Sea. For decades the central part of Russia was raided by Crimean Tatars. In 1571 they even made it to Moscow and burned everything except the Kremlin. The Tatars were defeated, but Russia was left in financial ruin. Ivan sincerely believed in God and generously donated to monasteries, even though priests were also killed on his orders. Educated and a good orator, Ivan IV established the first printing house in Russia with the help of Danish book printers in Moscow. The clergy was required to organize schools to teach children how to read and write. During Ivan’s era, something even similar to conservatories appeared in Moscow. At the same time, jowever, he was extremely cruel and vindictive (a trait which particularly manifested itself during the Oprichnina), personally giving orders for the most sophisticated executions. "We are free to admire our slaves and we are free to execute them," said Ivan. Ivan's father died in 1533, when the heir was only three years old. That year Ivan formally became Grand Prince of Muscovy, although obviously he could not govern the country. Influential boyars, representatives of the old aristocracy, fought for power. When Ivan was eight, he was completely orphaned. The Shuisky princes, who were his guardians, neglected him and even, according to Ivan, did not give him enough food. Historian Sergei Solovyov believes that it was Ivan's tough upbringing that formed his cruel character: "Self-interest, contempt for the common good, contempt for life and your neighbour's honour is what the Shuiskys sowed – that's how Ivan the Terrible grew up," said Solovyov. Ivan had at least six wives. He had eight children, most of whom died in infancy. His oldest child Ivan died in 1581. A series of chronicles say that the tsar accidentally killed the tsarevich, hitting him with a staff during an argument – though some researchers believe this is a myth, saying that the tsarevich died from an illness. One of the most famous paintings in the Tretyakov Gallery in Moscow illustrates this legend: Ivan the Terrible killing his son by Ilya Repin. It shows Ivan, an old man with mad bulging eyes, embracing his dying son, having realized in horror what he has just done.